We take this opportunity to introduce ourselves as one of the leading Registered Private Security Agency in Maharashtra. Our service line is supported by armed, unarmed and well trained civilians and ex-servicemen Security personnel and latest automated security and all types of monitoring and surveillance solutions. Our preparedness to accept any enterprising job of security & Facility Management work has made us one of the promising agency in the field. Threat Examination : Analyze Potential Exposure & Advice How to minimize exposure. Executive/VIP Protection : In the Professional & Personal aspects of the Executive’s life. Industrial Security : Detect, deter & report violations of company policy and the law. Special Events : Which requires a large number of officers for short period of time. High Rise Commercial Property : Watch & Ward, Access, Public Relations & Traffic Control. Security Audit : To pro-actively access tentative exposures, find out lapses & inform management. Parties, entertainment venues, promotional events, corporate meetings….You name it, we’ll secure it for you. And we make it easy. If you produce events at multiple locations, you will now have a single point of contact for all your venues. We are at your service, whenever and wherever you need us. Your company will automatically be named as an additional insured under our comprehensive liability insurance policy. There’s one thing nobody needs in the midst of planning, promoting, and staging an event–large or small: One more thing to worry about. The job is complicated enough without having to fret about such potential glitches as event security guards who just might not make the grade. May be you have seen the wrong, poorly trained or inefficient event security guards at other events, and maybe you know too well the complications they can cause. That is why SARA stands ready to take all of those event security worries off of your shoulders, with its exceptional corps of Event Security Guards who are always highly trained and licensed, fully insured, absolutely reliable, and–even with all that–surprisingly affordable. SARA knows that there is something very special about your event, and we believe there should be something very special about your event security, too. Electronic surveillance is the monitoring of a home, business, or individual using a variety of devices such as CCTV, legal wiretapping, cameras, digital video equipment, and other electronic, digital, and audio-visual means. 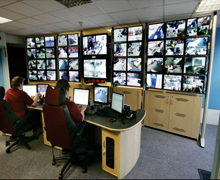 With our expertise we can provide complete CCTV installations, it monitoring & Annual Maintenance as per your requirements. We also provide temporary CCTV connections for special occasions/events.